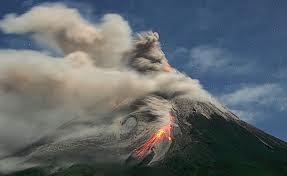 This morning, 7 November 2010, again Mount Merapi unleashing hot ash up to 6000 meters high according to 09.00 a.m news of Metro TV. The current wind blew the hot cloud into direction of Magelang where the Borobudur Temple is located. The Maguwoharjo Stadium in Yogyakarta where more than 15.000 evacuees take refuge seemed much more in order and clean now, because according the schedule, Madame Yudoyono the First Lady of the Republic, would pay a visit to this refugees camp this morning from her shelter at the Presidential Palace in Yogyakarta, not far from the stadium. Well, I am thinking, how nice would the first family be if they could take shelter in any of other damage areas of natural disasters in this country without thinking too much on their safety, even there were limited facilities, much less than a convenient palace once in their live time. And how lucky were the people in this country if Indonesia had ever has first family like the one we always dream upon who would be closed with the people while the peoples are in the danger and required thorough attention from their leaders. Well, perhaps that would only be in our dreams forever. No experts could predict, when the fiery mountain active blasts would stop, but the fact is the beautiful slopes of Merapi is now a deceased area, that required months and years to recovered. 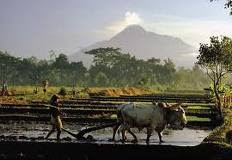 The Javanese people especially the peasants and the lower class workers are quite known as a hard working people, as it had been proved since centuries ago with the existence of Borobudur and Prambanan temple. They can make it this time again, as they have done it in 2006 after an earthquake had strongly hit Yogyakarta and Central of Java! May God bless my country always and forever. Amen. yes,, may God bless your country and people... hopes you're fine too.. Thank you for bringing this to our attention. I did not know this was happening. Must be living in a cave!